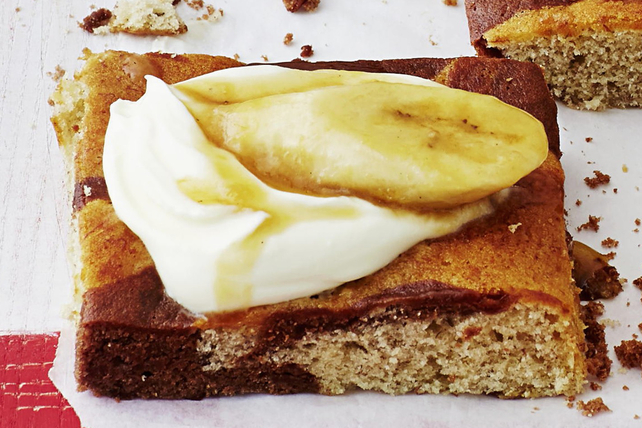 How do you make a homemade banana cake even better? Add some melted chocolate and you get this delicious Marbled Chocolate-Banana Cake. Whisk first 4 ingredients in large bowl until blended. Combine flour, sugar and baking soda. Add to banana mixture; stir just until moistened. Pour 1/3 of the batter into separate bowl; stir in chocolate. Pour plain batter into 13x9-inch pan sprayed with cooking spray; top with spoonfuls of chocolate batter. Swirl gently with knife. Bake 45 to 50 min. or until toothpick inserted in centre comes out clean. Cool completely. Serve topped with thawed Cool Whip Whipped Topping and banana slices. This delicious cake can be baked ahead of time. Cool completely, then store in tightly covered container in freezer up to 1 month. Thaw in refrigerator before serving.